In the wake of the upcoming independence day, search giant Google has come out with Google Impact Challenge in India, to celebrate creativity and entrepreneurship in the world's largest democracy. As part of the challenge, the company will spotlight the best local nonprofits organisation's that are using technology to improve people's lives. 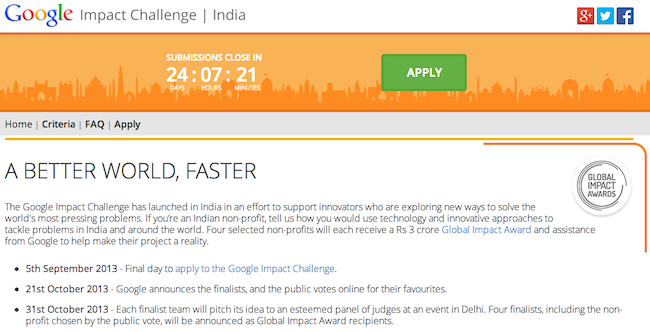 At the end of the challenge, four nonprofits will each receive a Rs 3 crore (around $500,000) 'Global Impact Award' and technical assistance from Google to bring their projects to life. In order to apply for the challenge, Non-governmental organisations (NGOs) will have to submit their application here by end of day 5th September 2013. Note that the company is looking for NGOs who use any type of technology, which can come in many forms, from monitoring clean water wells with hardware sensors, improving education through big data analysis, or improving the lives of older people through digital literacy trainings, among others. All applications received will be reviewed by a team of Googlers, post which the company will announce the 10 finalists on 21st October 2013. The company will also showcase a video (that it will also help the NGOs create) about each of these project on its website for public voting. While finalists will need to travel to Delhi, the company will pay for 'reasonable' travel expenses. Four award recipients, including the organisation with the most public votes, will be announced at the end of the event. "On October 31, I will join Ram Shriram (board member of Google), Jacquelline Fuller (director, Google Giving), Anu Aga (business woman and social worker) and Jayant Sinha in Delhi to hear the 10 finalists pitch live. As judges, we'll select three awardees based on their potential impact, scalability and ingenuity. We'll also announce the winner of the Fan Favorite award, according to public vote," wrote Nikesh Arora, senior VP and chief business officer at Google, in an official blog post. There is no registration fee for the challenge, and it is only open to non-profits that are registered in India. While an India registered non-profit that do work outside the country are eligible for the challenge, a for-profit business with a social impact within India cannot apply. Projects will be judged on their innovative approach and potential to scale.